Stores reference 6B/140. 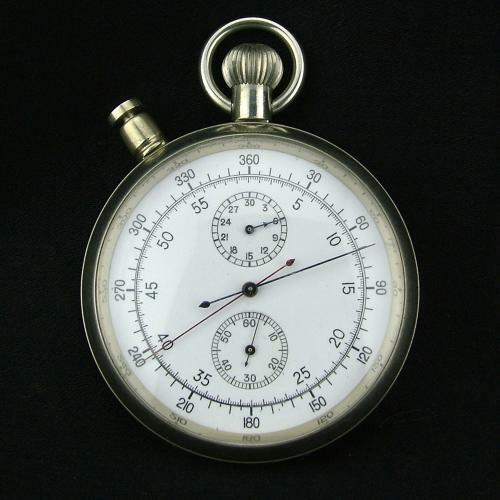 This stopwatch has a split-second chronograph action and was used to perform complex performance tests, bombing runs and for navigational use. White metal case approximately 6cm diameter. White enamelled dial with twin subsidiary dials measuring seconds from 1-60 and minutes from 1-30. Arabic numerals. It has a frosted gilt 17-jewel eight-hour keyless Swiss movement with beats to one sixth of a second and two centre second hands rated to one revolution per minute. It is provided with two control knobs. Successive pressings of the large central knob start, stop and reset both centre hands of the chronograph as well as operate the 30-minute counter gear. When the side knob is pressed the lower centre second hand stops enabling the user to make interim timings. This knob has no control of the 30-minute counter. If the pendant knob were first pressed so as to bring the centre seconds hand into action, a sequence of pressings on the side knob causes the lower centre seconds hand alternately to stop and then fly into sync with the upper second hand. Pressing the pendant knob again then stops both centre hands and a further depression will reset them. The case is in very good used condition with King's crown, Air Ministry markings and reference numbers engraved on the backplate. Both knobs function correctly and the watch bow is original. The dial is in excellent condition. The back cover is hinged and a hinged dust cover sits beneath. There is some light scratching/burring where these have been opened. The movement works correctly and appears to be keeping good time. A scarce very high quality timepiece. Stock code C23288.